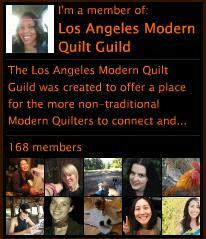 The Los Angeles Modern Quilt Guild had a potholder swap for our December Holiday Gift Exchange. At first I wasn’t extremely excited but, when it came down to it I had an absolute blast. There was a problem though. 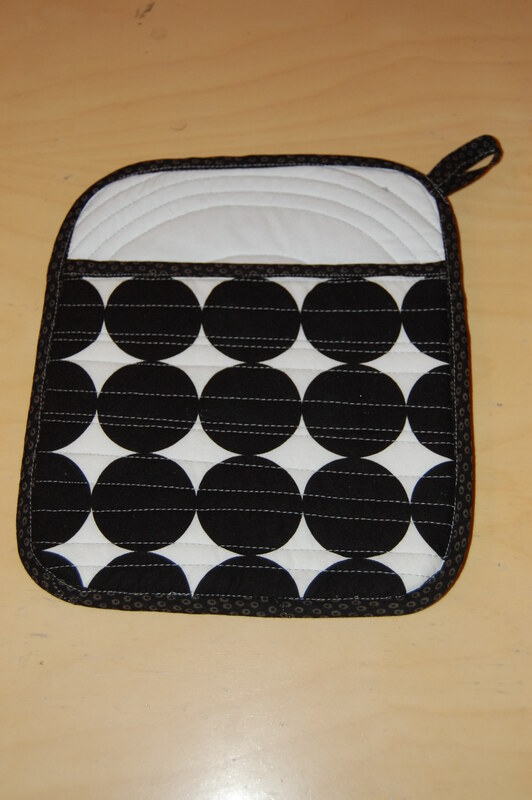 We had to design ONE potholder. 😦 One potholder? Are you serious? That was excruciating for me! So, instead of one, I designed FOUR! I know, I know. That’s a few more than one but, I had fun AND I got to try out some new techniques that I hadn’t tried before. 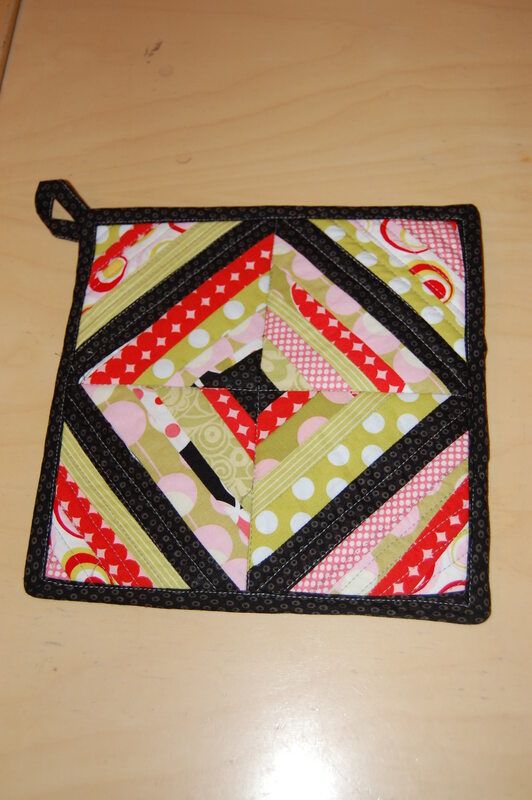 The biggest thing that I got out of making potholders is that they are like a tiny mini quilt. Like a one block quilt. 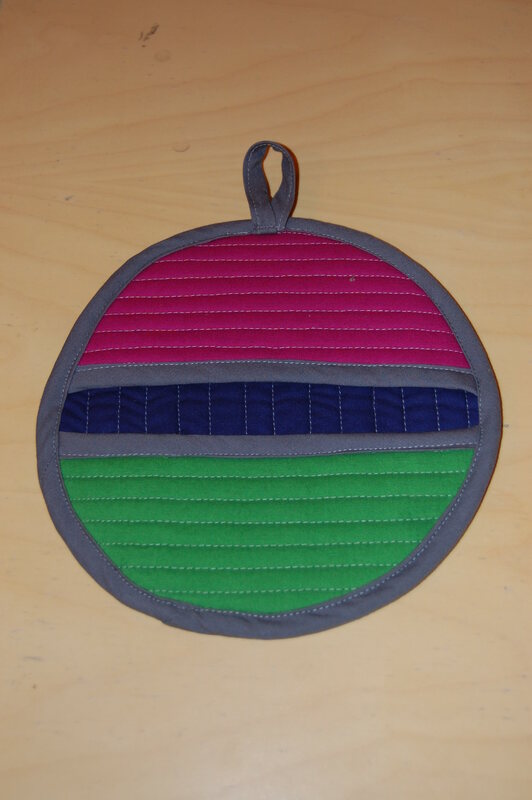 Anyhow, here are the potholders that I designed. Let me know what you think. The photos aren’t that great because I waited until I got to Home Ec. for the guild meeting to snap photos and wrap them! I’m really into solids and I have a sketch in my quilt sketchbook to make a quilt using 1″ strips (1.5″ strips with 1/4″ seam allowance on each side) of a variety of solids. 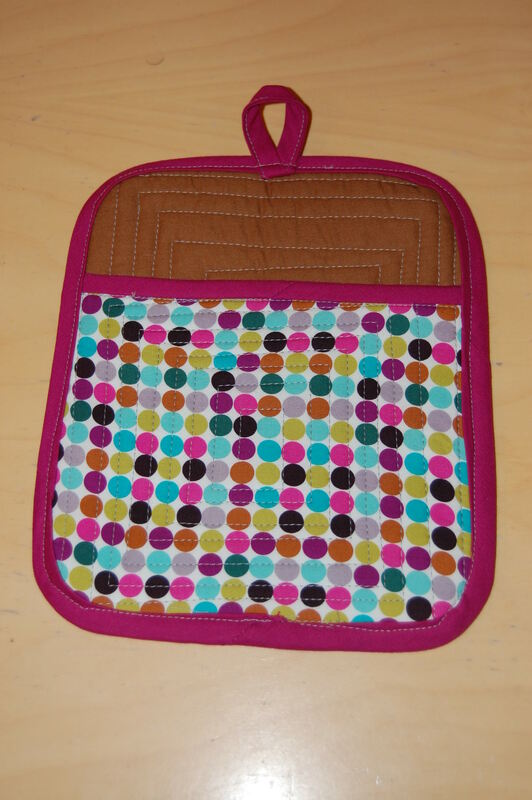 So, I decided that my first potholder would be a mini version of this – with 1/2″ strips. I LOVE IT! I can’t wait to make a quilt like this. Very modern and chic. And fun as a potholder. Of course this one had to be circle. I just love circles – and it really seems to balance the linear design of the 1/2″ strips. The details were fun too because I put lots of colors on the back too – even inside the pockets have different colors – I didn’t take pictures though. So, I’ve never done the improvisational log cabin block that everyone does. 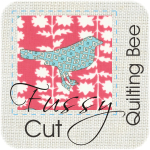 For some reason, I’m more drawn to clean lines and exactness in my quilts. So, this of course was my chance to do it. I had just bought a few pieces of the Alexander Henry Lorenza fabric in the Onyx colorway so I decided to have a go at it. I paired it with a couple of really weird Kona Cottons that I had bought for another project and they matched perfect. I bound it in Kona Cotton Cerise – one of my current favorites. 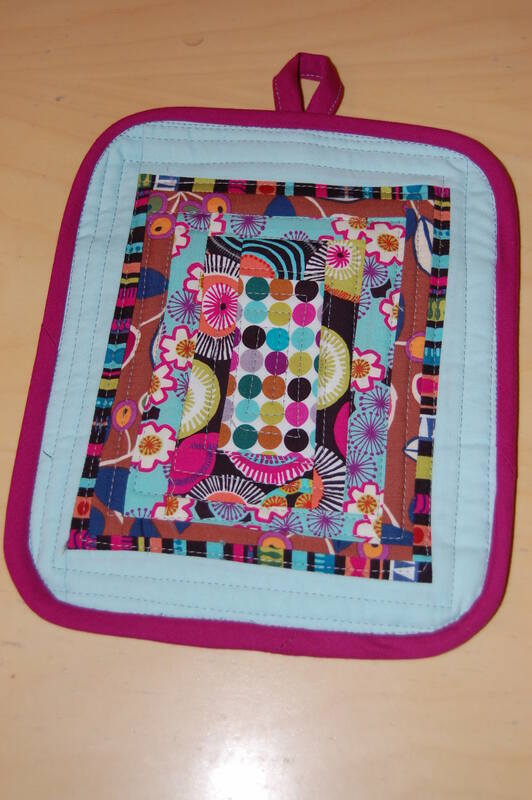 I hadn’t yet convinced myself to invest the energy in string piecing a whole quilt but, I’ve always wanted to try it. So, here was my golden chance. I had fabric left over from my Strawberry Disco Fields quilt and pulled a couple of other prints from my stash. It turned out to be a lot of green and a little red and black sprinkled in. 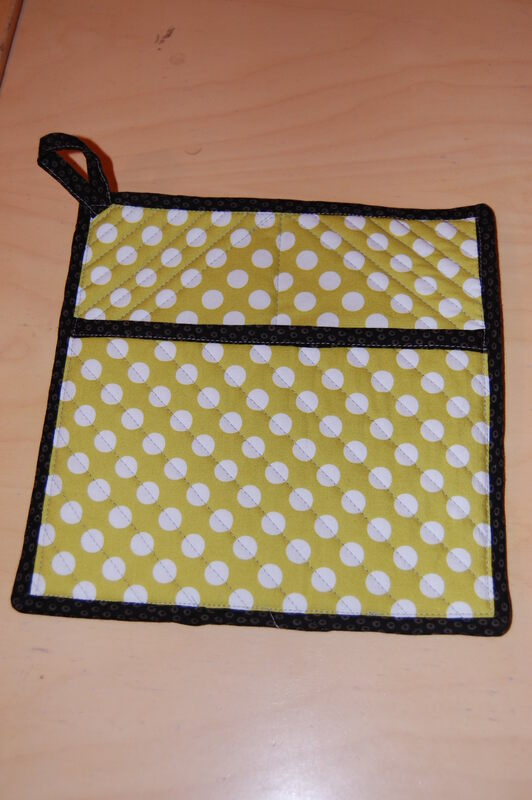 So, I highlighted the green and just put one print on the back – a green and white polka. But, there a surprise inside! A little more of the Very Berry fabric! Once again – I didn’t get photos of the inside but, you’ll have to trust me! When pulling fabrics from my stash, I had a stack of black and white next to a stash of green and whites and I just loved the combo. I just had to do something with this. I, as most of you have since established, love circles as well. 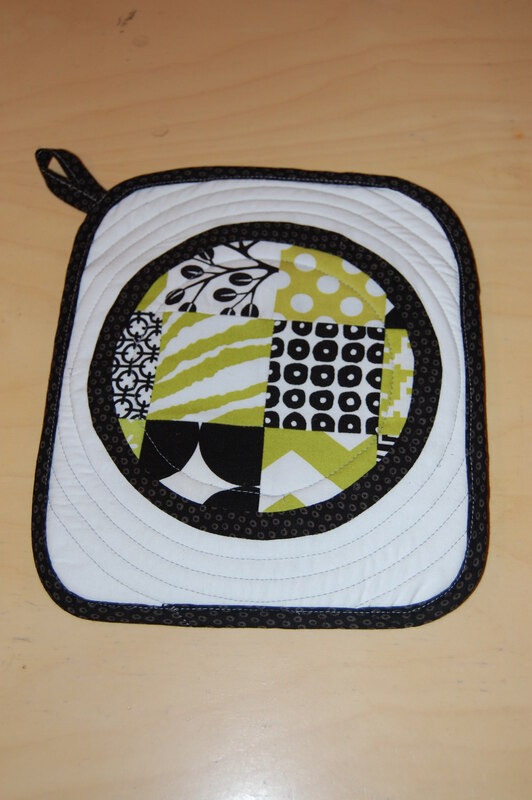 So, I just pieced squares of various alternating green and white & black and white fabrics in a little patchwork block and then I pieced this into a black circle which I then pieced into a whit background. I had fun with concentric circle quilting lines on this one. I also love the back. Pretty simple. But, I’ve always loved the Disco Dots fabric by Michael Miller in Black and White so I had to highlight it. The back is a little bit of a mistake. My intention was to have a green and white print at the top where the white is but, I think I placed it upside down. Oh well, another perfect mistake! 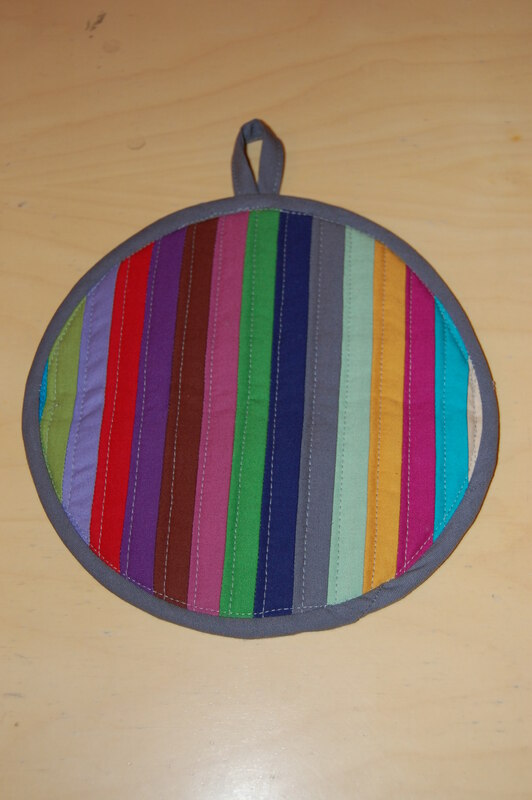 Great potholders! I especially love the solid strips and the black, white, and green ones. They are all so cool, Latifah. You are so creative. I’ve gotta try the circular one. I had so much fun last night and it was great to finally meet you. Can’t wait for the next one! Love this last one with the nine patch inside of a circle!